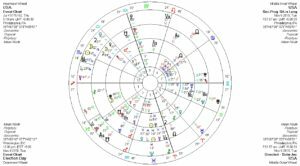 Election Day will occur when Venus is retrograded back into one of its two ruling constellations, Libra. (The other Venus rules is Taurus.) Retrograded Venus will be conjunct the motherly Ceres and a Sun/Moon conjunction or New Moon in deep penetrating Scorpio. This is serious girl power. Many woman voting will be doing so not for themselves but for their daughters (Ceres) as they manifest (a New Moon activity) a new world order. This powerful placement will be in the 11th house of the US, that which signifies groups coming together to make changes – big changes – to the status quo. Expect miscommunications and even interference again into our system as retrograded Neptune crosses the third house. Neither side is going to get exactly what they want – the patriarchy will get something to be thankful for but this will be a surge of pink energy the likes of which we have never seen before. Go Pink.